Having spent an afternoon fishing a mayfly hatch in the River Test, with hobbies diving around your ears, the only decent thing to do is find a riverside pub. 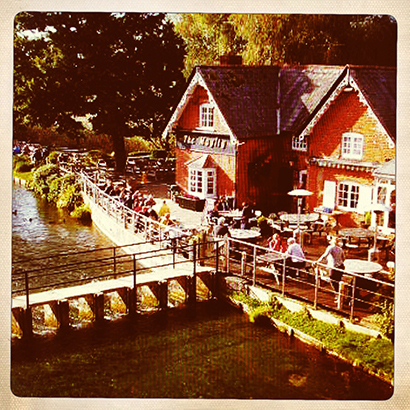 The Mayfly, at Fullerton tends to get busy, especially on a sunny weekend, but with good reason. The location is dreamy. The inside of the pub might seem slightly too functional, but the garden is where you’ll find the true treasure. The Test passes the tips of your toes, and the trout here have grown fat on people’s leftovers. There are fish of ten pounds or more, while the local river keeper speaks of a chub of similar size that used to sit beneath the downstream willow picking off scraps that the trout and ducks missed. It’s the perfect spot for an evening jar – to a soundtrack of reed warblers and bubbling chalkstream.